I've been binding my little heart away this weekend. This quilt pattern is called Buttercup from my favorite book these days called Stop, Drop & Roll by Heather Mulder Peterson. I am a big fan of hers. This was my second project (my Baby Bloomer wall hanging was the first) from that book. All of the applique was fast. I used a few different methods. There's a little hand applique and a little machine applique (using Heat n' Bond and a couple different stitches). Heather's directions make it easy and fast! This is my backing. Do you see the little knots on there? You don't notice them from the front but they are all over the back. This happened another time that this quilter quilted something for me. Last time she said she wouldn't charge me, but when I went to pick it up I told her it wasn't that noticeable so I paid her full price. I probably shouldn't have done that, but I did. So when it happened this time, I called her and talked with her about it. She will be giving me some credit on my next quilt (or doing it for free?) so that will be nice. Not sure what happened here, but it is kind of a bummer. I get so frustrated sometimes, because it seems like there is always something wrong with the quilts that I get back. Not sure if I expect too much (?) or what... Anyways. I love it from the front and she really did do a great job - she free handed all of the quilting. She did tight quilting and the design was beautiful. She said she checked to see if it looked o.k. on the back and just didn't notice the knots. I just need to focus on the postive. I love the quilt and those knots can be fixed, they just take a lot of time to work out. Anyways, this quilt is off to Just Sew tomorrow for display so it's good-bye for now. I've never sent a quilt to a longarmer so I'm very interested in the comments you'll be getting back. It does seem to leave a lot of freedom to them when they get to select how it's quilted. I often wondered how that works out. I'm sorry you've had so much trouble and I hope you have a better experience next. Your quilt is cute! I love the fabric you selected! The bird is just adorable and I love the way it's quilted. The book you mentioned is on my Christmas list. Amber, I love your quilt and am very sorry to hear about the knots! I also have not sent any quilts to a quilter and had no idea that they might send back an imperfect quilting job. I am also interested to know what the solutions might be. keep up the beautiful work!!! OMG...found this photo, stopped and had to come over to your blog! It is gorgeous! I love the color!! I am a longarm quilter and I'm guessing that the knots on the bottom are from your quilter not holding her bobbin and top tails snug when starting off the quilting or even pulling the bobbin to the top. I agree with SandyQuilts. Long arm quilters are a dime a dozen in Utah. Find someone new if you are not happy with the quilting quality of your quilts. You shouldn't be having this problem. One, your longarm quilter isn't worth much if this is the work she's putting out. She has no business quilting for others. Two, it's not difficult at all to find another quilter. They're everywhere these days. Even if you have to go with someone living farther away and mailing them the quilt. Three, you work hard to make the top. You deserve a good quality quilting job. I don't know where you are in Utah, but I am certain your local quilt shop could recommend some good quilters for you. Good luck! Amber, I love it...the colors and the design and everything. That's frustrating when it's not perfect because it takes so much time and money to get it to that point in the first place. I'm glad you got some credit at least! Holy Cow! You are fast woman. It looks fabulous. Too bad about the knots in the back, it's nice to have a credit, but really, ya kinda wonder if ya should go back. So cute Amber! Love it! Beautiful. You are so talented. Amber, the knots are definitely something you DO NOT need to put up with. They're very noticeable in your photo, and I know my long arm quilter wouldn't let anything like that out the door. They seem to be close together, so it's a bobbin issue with her machine, perhaps? Have her quilt something for your for free, to give her another chance, and then find a new quilter. 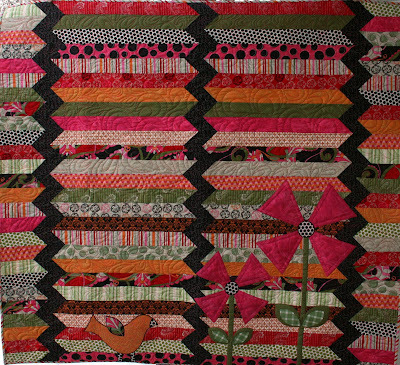 I love the quilt, and I too, love Heather Mulder Peterson's designs! love, love, love it! One of my favorites you've done. I think everyone offered good ideas, use the credit for something you won't mind if it doesn't turn out perfect and then move on. Amber, I LOVE this quilt. I think it's my favorite.